The figure used for this unit is a modified Heroclix figure from the TMNT Heroes in a Half-Shell set. Its model number and name is #006 / Foot Ninja (Katar). As a figure that starts the game off the battlefield, Raiden has these Off the Battlefield Synergies. As a Protector, Raiden has these Protector Synergies. As a figure with the Super Strength special power, Raiden has these Super Strength Synergies. 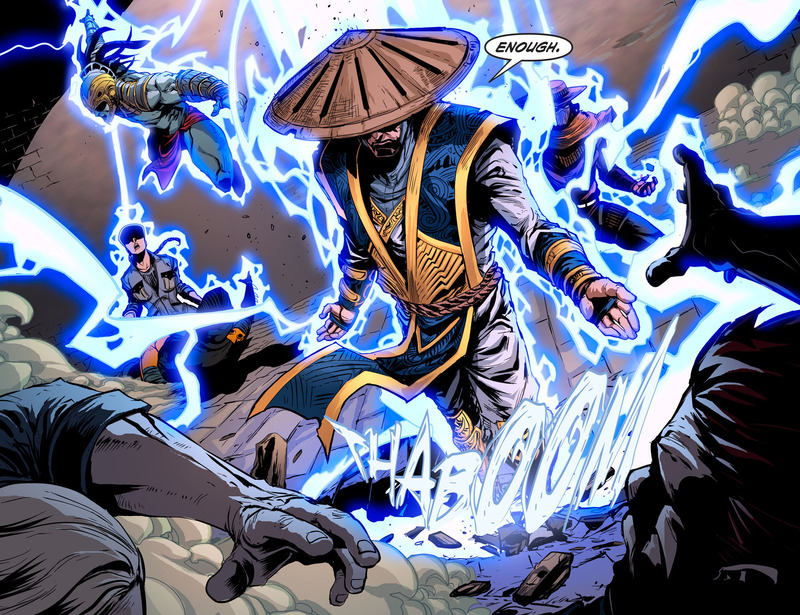 As a figure with the Super Strength special power, Raiden interacts differently with these special powers. As a flying figure, Raiden interacts differently with these special powers. Raiden was created by Ed Boon and John Tobias. Last edited by Ronin; April 6th, 2019 at 08:22 PM. Raiden does not start the game on the battlefield. Once per game, when a Common or Unique figure you control would be destroyed, you may instead place Raiden from this card onto an empty space adjacent to that figure. That figure is not destroyed and, if it would have been destroyed by receiving wounds, ignore those wounds. After placing Raiden with this special power, move all unrevealed Order Markers on Army Cards in your army onto this card and, one at a time, roll X unblockable attack dice against each enemy figure within 3 spaces of Raiden, where X equals the number of destroyed Heroes in your army, to a maximum of 2. Once per turn, after moving, attacking, or defending with Raiden, you may place him on any empty space within 3 spaces of his original placement. When moving with this special power, Raiden will not take any leaving engagement attacks. After revealing an Order Marker on this card and taking a turn with Raiden, you may roll the 20-sided die, adding 1 to the roll for each destroyed Unique Hero in your army and each Wound Marker on this card, to a maximum of +7. If you roll 20 or higher, you may take one additional turn with Raiden. Last edited by Arkham; January 31st, 2019 at 09:15 PM. Start with a Tanuki #19 Jungle of Despair Pathfinder Battles figure as pictured below. Cut the hat off. You'll need to trim the hat down, I found using toenail clippers to work quite well due to the curved nature of them staying pretty well in line with the hat, to not lose the rounded shape. You have to trim the hat down quite a bit to make sure it doesn't fit too big on the Foot Ninja figure. After trimming it smaller in circular size, you'll end up with a very thick looking hat, which then you will want to, very very carefully not to hurt yourself, use an exacto knife to cut the hat to be thinner(try to take a layer of the white excess part that's underneath the actual hat design). Then make sure the hat fits and looks decent. Isn't too thick and isn't too big. Remember, you can't go backwards on the hat. So as you take off a thin layer around the edge to trim it down in size, make sure to see how it looks before going any further otherwise you risk making it too small. Remove the weapons from the Foot Ninja(Katar) figure. Once again, toenail clippers work well for this. Next you'll want to paint his face flesh colored, being careful not to go over the white eyes. A black trim around the white eyes looks decent. Then slice off the top of the head of the Foot Ninja figure, right above the eyes, which will allow you to glue the hat on. A very slight angle, lower on the front, higher on the back, allows the hat to shadow his eyes a little. After doing so, you can test how the hat looks and fits, to determine if more needs to be cut away from the hat to make it look accurate. The hat should go out to the end of his shoulders. Refer to below pictures to have the best idea for comparison. Now you can paint the white on his outfit. Legs, sleeves, under boots, and undershirt as pictured. Paint the "V" part in front, the sash/loin cloth, and the back blue. This is optional, but you can paint the trim of the blue with some gold, as well as the black belt with some gold trim, along with his bracers and the front of his boots/kick pads gold. You can paint some black on the undershirt to lessen how much white is around the chest area. Check how the hat looks one last time, as it's now time to glue it on. Last edited by Arkham; January 31st, 2019 at 12:50 PM. I'm pretty happy with where this is at. I think the Divine Intervention wording relating to Raiden being the last one you control on the battlefield may be better off as him being the only figure in your army not-destroyed. That will avoid Fury and drop team waiting on the sidelines while Raiden goes all-in right away. That said, it wouldn't be too beneficial, as Raiden works best after 3 allies have been destroyed. So it may be a non-issue. Raiden does not start the game on the battlefield. Once per game, when a figure you control would be destroyed, you may place Raiden from this card onto an empty space on the battlefield, and place any unrevealed Order Markers on Army Cards in your army onto this card. After Raiden takes a turn, if he is the only figure you control on the battlefield, he may take one additional turn. This serves a similar purpose. Avoids the awkwardness of Raiden potentially getting beaten on for a round by the enemy because he has no Order Markers on his card. Represents him teleporting down to the battlefield in a bolt of lightning. And even gets across how he can take things into his own hands(taking the Order Markers is not an option to the player). You'd still want to wait 'til the end of the game to pull the trigger on it to get the best bang for your buck with him, but there are some benefits of course to bringing him earlier(possibly more targets for Thunder God, and to receive any synergy bonuses/boosts allies may provide). I really, really, really like that. Should that have a destroyed by an opponent clause? Possibly, couldn't hurt. Though you may run into a very rare corner case where you screw yourself out of the opportunity to bring him in by your last 2 figures somehow being destroyed by a special on one of their cards. Or Malekith is posing as a friendly figure. ...Or Magneto dunks someone into a lava bath placed by Magma. I'd leave it as is, I don't see the issue, and it opens up room for the opponent to exploit it otherwise. Fair point. Probably best to avoid those really odd situations, which would completely kill the idea and theme. I REALLY, REALLY like that mod! What is the smaller mini called?